Crypt of the Night Mother is a small cave beneath Bravil in which the Night Mother can be summoned (quest-specific). The Crypt of the Night Mother can only be accessed during Honor Thy Mother, through a hidden entrance in the Lucky Old Lady statue in Bravil. It is the location of the final confrontation between the traitor of the Dark Brotherhood, Mathieu Bellamont, Arquen and the future Listener. None of the items here are owned and are free to be taken; in fact they serve as a quest reward for the Dark Brotherhood quest line. 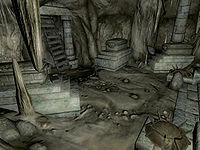 The entrance seen facing the altar and the reward chests randomly sprawled throughout the rest of cave. The tomb appears to be a circular natural cave with several manmade pillars supporting it. The only entrance, a trap door with a ladder, is at the western end of the cave, with an altar at the opposite end. In the southwestern corner, a large chest has the books The Brothers of Darkness and The Five Tenets sitting at its base. At the northern end of the cave, the Night Mother herself can be found nestled in between two large chests, the northwestern chest having one sample of mort flesh and morning glory root pulp at its base, while the northeastern chest has a sample of bonemeal at its base. The southwestern and northeastern chests may contain leveled magical arrows, a leveled enchanted weapon of any style, a leveled enchanted piece of armor that can either be heavy or light, and a leveled filled soul gem. The northwestern chest may contain a leveled potion of restore magicka, a leveled ring, and a leveled empty soul gem. The altar is on a raised platform, making it the most prominent location in the chamber. The steps leading to the altar are flanked by four braziers, with the two lower ones turned upside down. On the altar slab lie a bloody skeleton presumably the Night Mothers bodily remains. Two groups of partially melted candles can be found at the base of the altar, with one collection of candles on the altar itself. 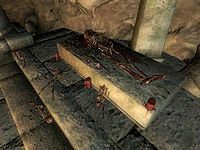 Five small-childlike skeletons are at the base of the altar, likely symbols of the children that the Dark Lord Sithis supposedly sired with the Night Mother. Samples of blood grass, nightshade, void salts, motherwort sprig and the ultra-rare lichor can be found on the altar next to the skeleton. An NPC named Night Child was intended to be present in the crypt. He never made it into the game, but is still present in the Construction Set. Esta página foi modificada pela última vez à(s) 15h58min de 2 de novembro de 2013.